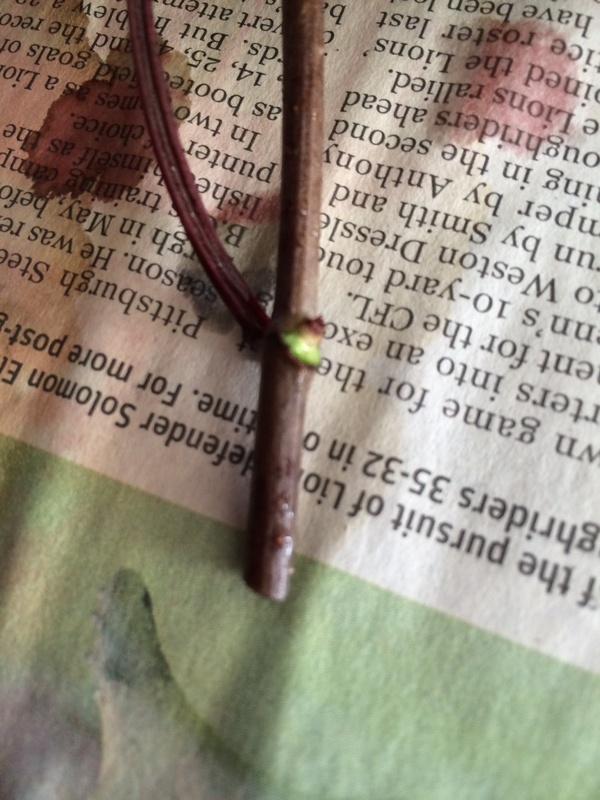 I read an article the other day about propagating shrubs from softwood cuttings, which inspired me to have a go. 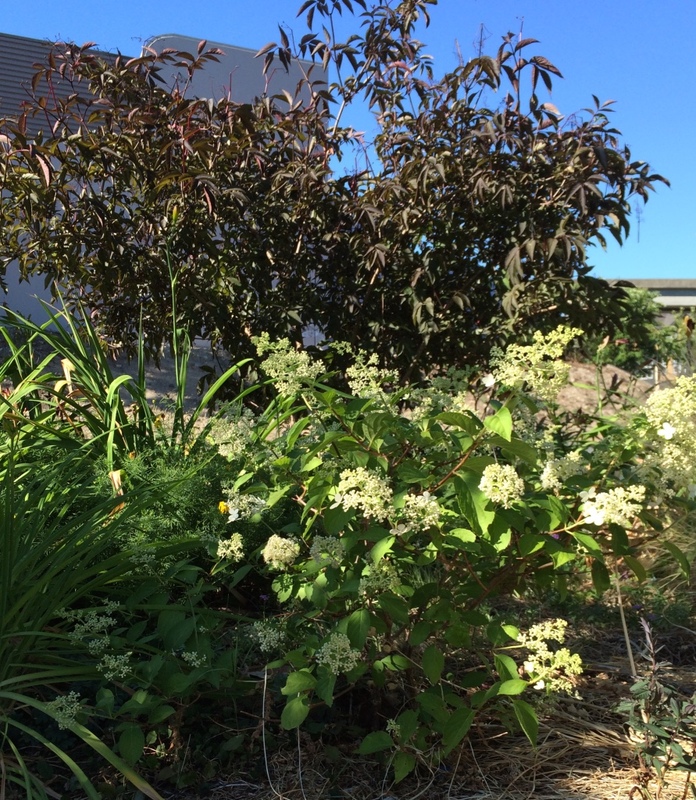 I have two Sambucus nigras— a ‘Black Lace’ and a ‘Black Beauty’. 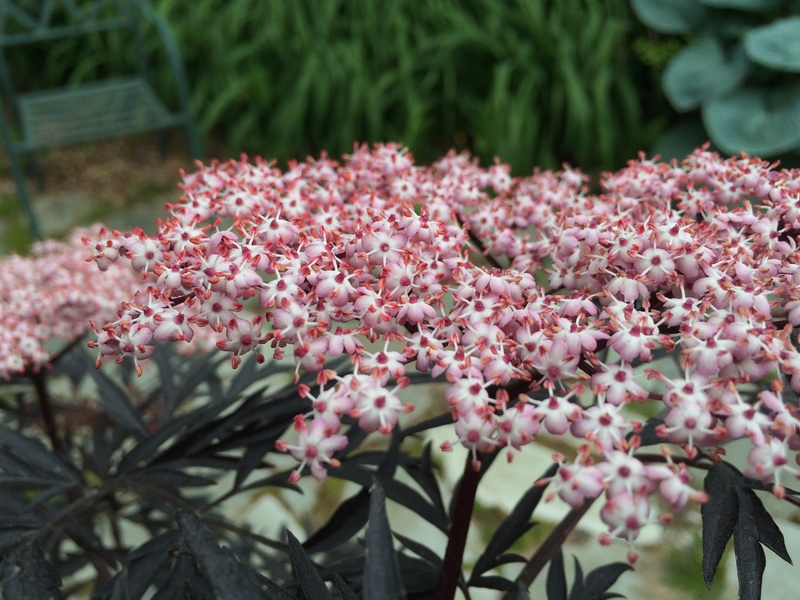 The ‘Black Beauty’ has been wonderful–dark foliage, a lovely shape, and beautiful umbrella-like pink flowers in the late spring. Now I want another ‘Black Beauty’ to fill the spot. 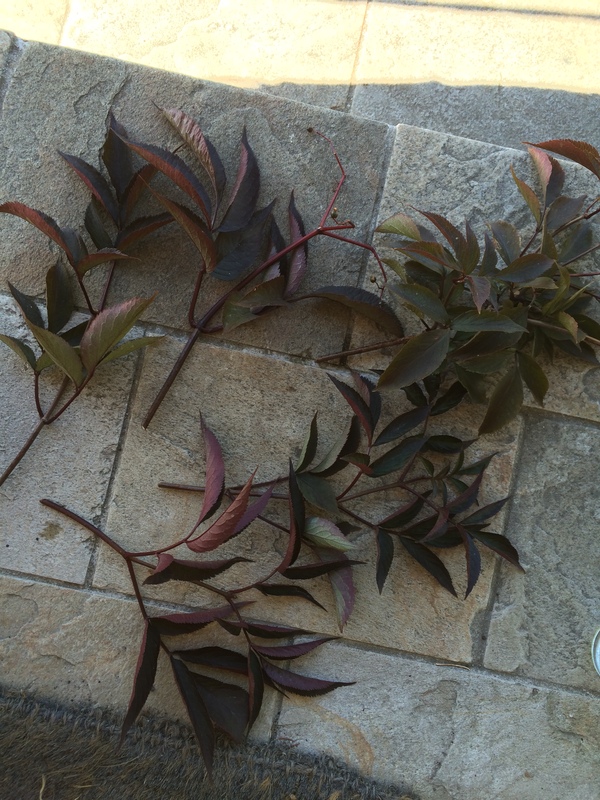 What a perfect time for the inspiration to propagate with softwood cuttings to strike. Thanks Gardener’s World for the tutorial. 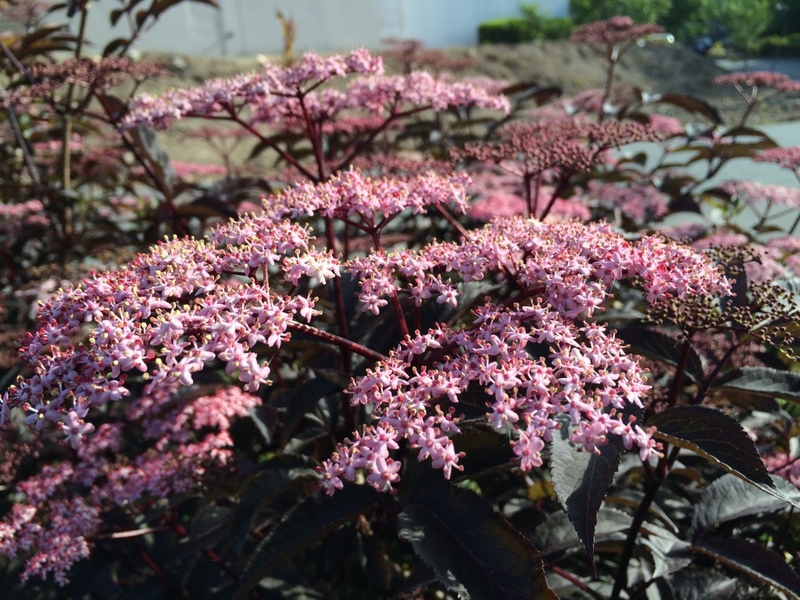 So now readers, you get my tutorial: I’m going to try to increase my stock of Sambucus nigra ‘Black Beauty’ and show you the steps as I go along. 1. First problem is finding the softwood cutting. 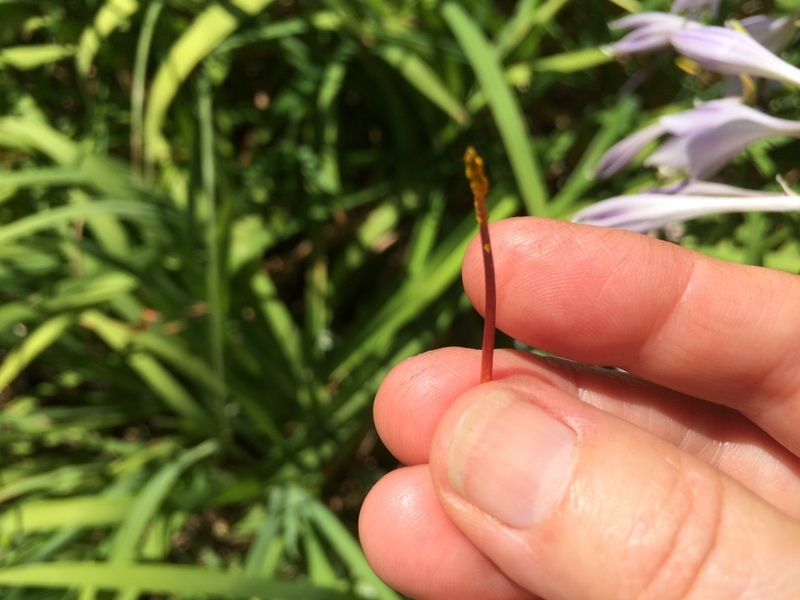 According to the article your cutting should be a non-flowering lateral shoot, this year’s growth, and neither very young nor old enough to be woody. Hmmm, non-flowering. Almost all the branches were flowering branches. These are the cuttings I’ve chosen, but only one of them is “non-flowering”. 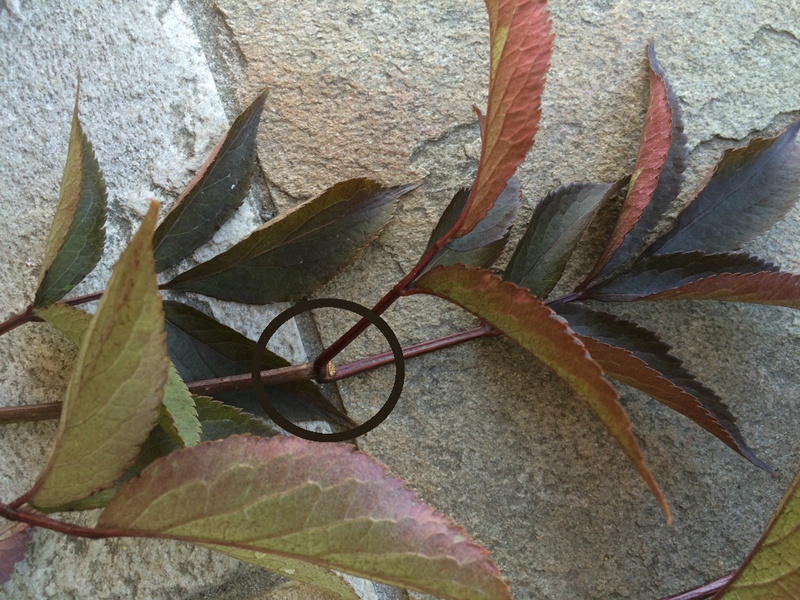 Sambucus nigra; this one had no flowers on it. 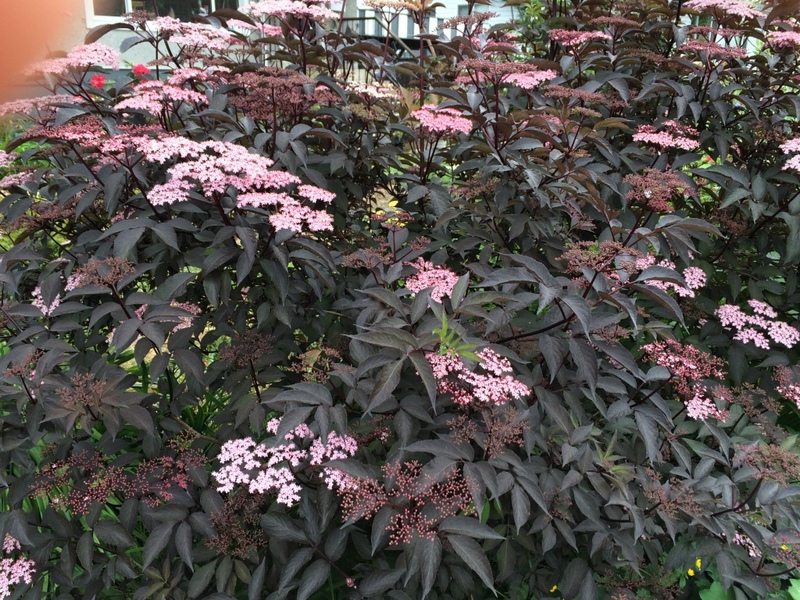 Sambucus nigra. Initially it looked like a non-flowering shoot, but looking more closely I saw the stump where the flower stem fell off. Never mind. I’m going to use them all, and if only one grows roots, all I really need is one. The “softwood” part is a bit subjective: Gardener’s World didn’t define “softwood”, so maybe it’s not critical to get that exactly right. Susan Grillo from Fine Gardening defines softwood as mature enough to snap off when bent over. Too immature and it just bends, and too mature doesn’t snap because it’s too woody. I didn’t really test mine; I think they’re pretty soft, but too bad. The concern with too immature is they don’t have the structure to stay alive long enough to get roots. If mine collapse and rot, I’ll just try again in another month or so. 2. Roots are going to grow from the area just underneath the outermost layer, because that’s where the growth hormone that stimulates root growth lives. So I’m going to do two things: strip the bottom leaves off, leaving a little “wound”, and scrape a little bit of bark at the bottom tip. 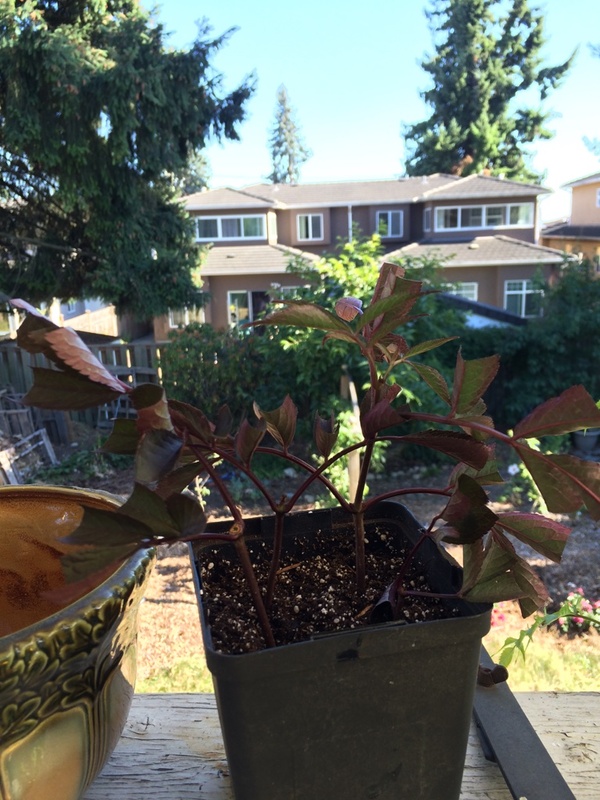 This pic is a bit fuzzy, but only realized it after I’d planted up all my cuttings. 3. Next thing is rooting hormone: this is the same hormone that the plant produces naturally, so by applying some, we’re just giving the cuttings a bit of a boost. Sort of like an energy drink. I’ve read somewhere that rooting hormone (usually in powder form, altho’ mine is a gel) is only fresh for 6 months and after that should be replaced. Mine is at least a couple years old, and doesn’t have an expiry date on it. So I’m using it. 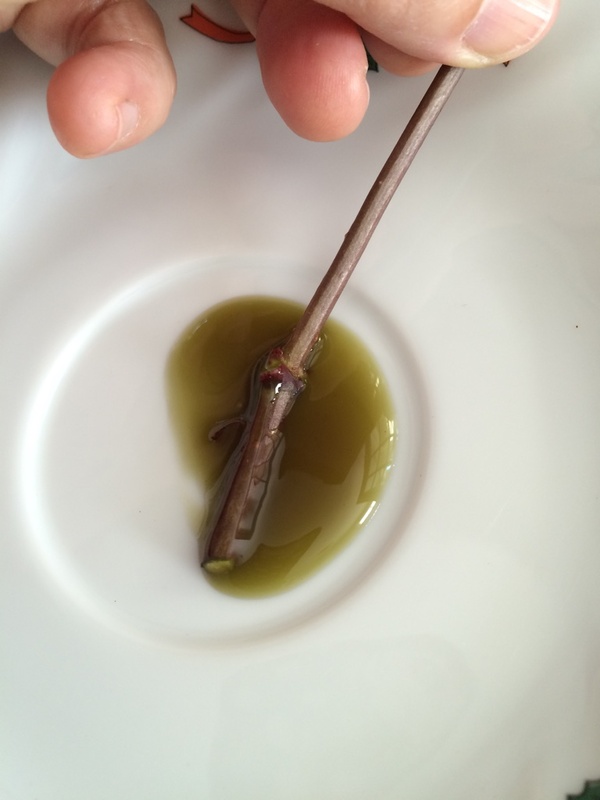 Ucky green gel–looks a little like slimy algae! Most package instructions say to dip the cutting in the rooting hormone, but I poured a little into a saucer so that, if there’s some bacterial or fungal contamination, it won’t get into the bottle. 4. 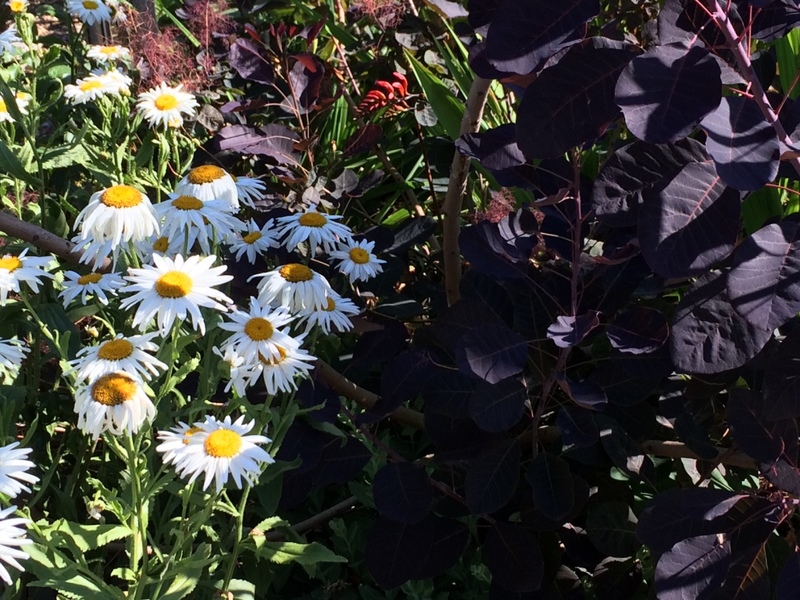 Planting: This is the easy bit–well, it’s all been easy, once you know how. Seedling potting mixture, dampened, not drenched, dib some holes with a pencil, tuck in the cuttings. 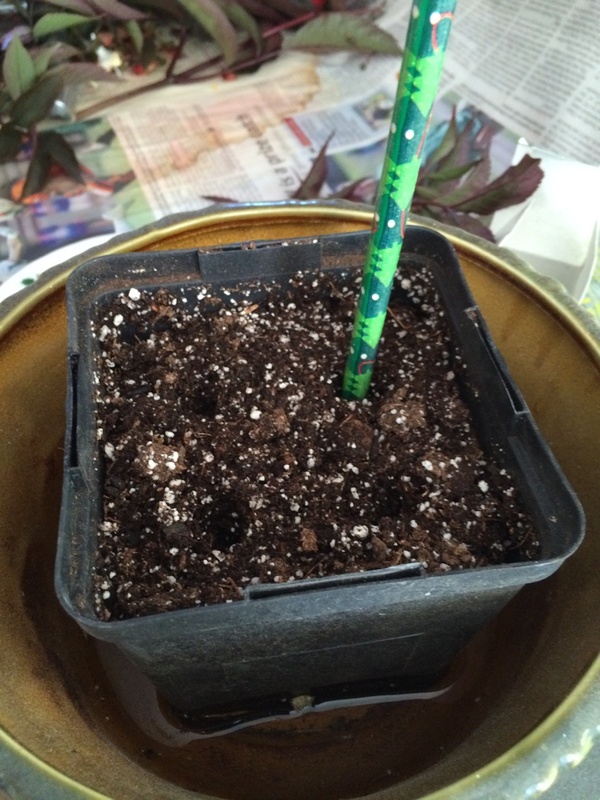 Seedling potting mixture in a 4″ pot. Holes for the cuttings. Four cuttings, four holes. All tucked in for bed. A couple of things to notice in the picture above: I cut all the leaves in half to reduce the amount of moisture that the leaves breathe out (“transpiration”). But the leaves are still photosynthesizing (making energy from the sunlight), so which does the cutting need more: energy or moisture? Don’t know the answer to that, but almost every source says to cut the leaves in half. So I did. The other thing to notice is how slumpy the cuttings look. It’s recommended that the cuttings be taken early in the day so they have maximum moisture. I cut mine at 4 pm, at just about the hottest part of the day, just about the hottest weekend we’ve had in this hot dry year. Not optimal. But I’ve heard it said that the best time to do something is when you have the time and inclination. That’s when I had the time and inclination. Nope, not trying to suffocate my cuttings. 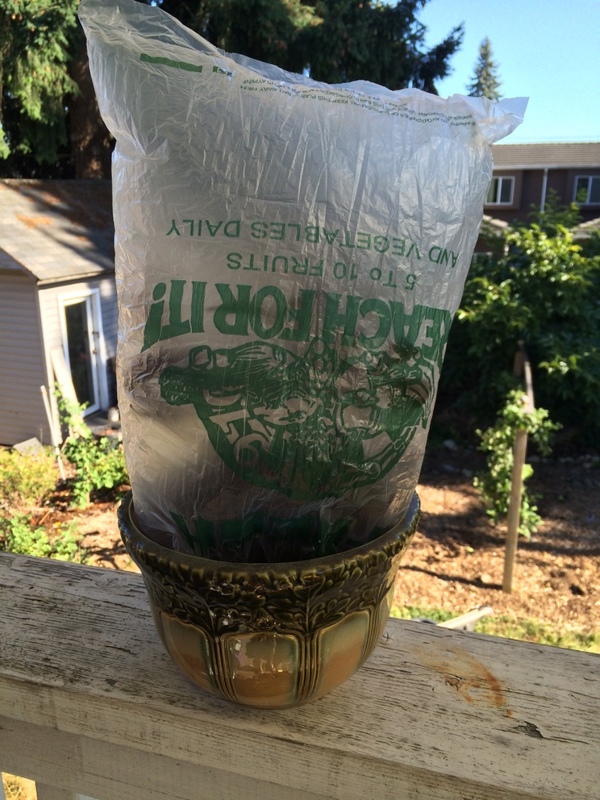 Cover the whole pot with a plastic bag, secure with a rubber band, and inflate it with a straw (or put a couple chopsticks in the pot) to keep the bag off the leaves. That maintains humidity, again helping to prevent the cuttings from drying out before they have a chance to put out roots and begin to fend for themselves. Now we wait. And watch. 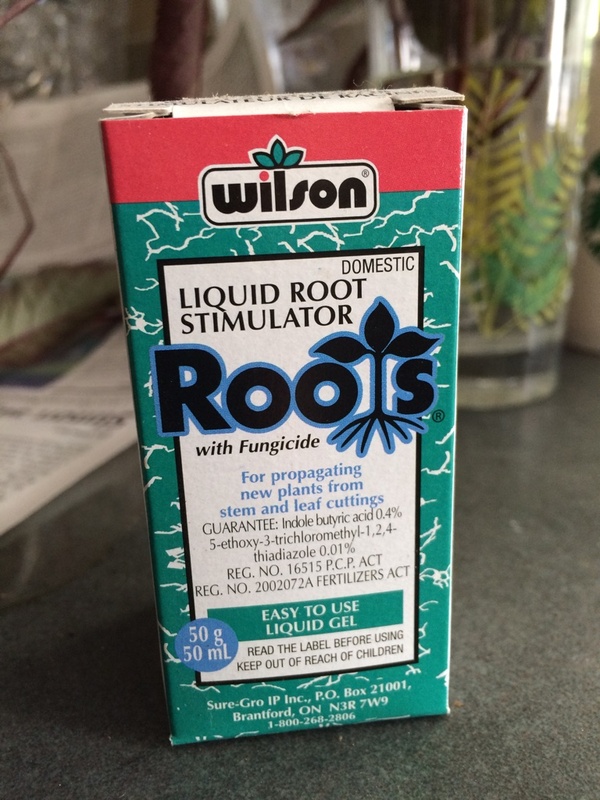 I’ll check the potting soil for moisture every few days, look for any fungal growth that would signal the death knell, and then in a few weeks I’ll give a gentle tug on the cuttings to see if they’re growing roots. If there’s resistance, there’s probably roots, so I’ll leave them a little longer until there are roots growing out the bottom holes, and then divide and pot up individually. I’ll keep you posted. 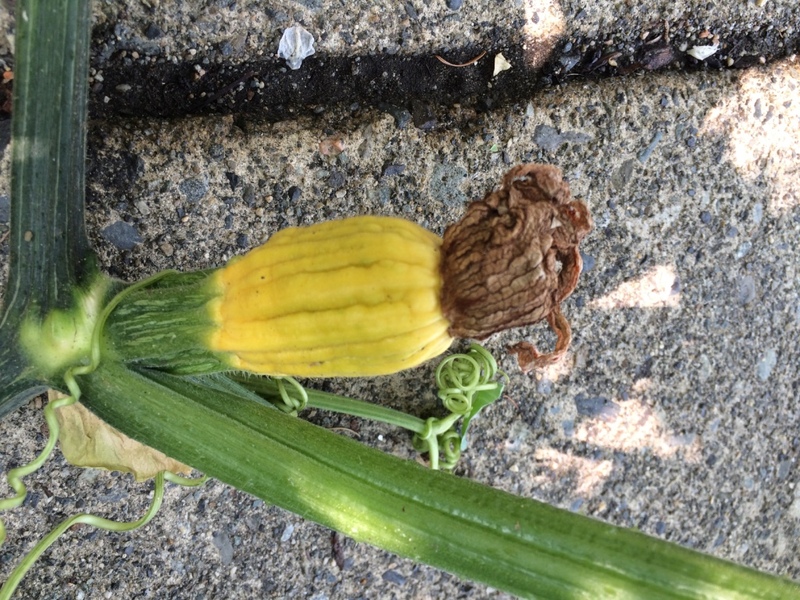 A few years ago I tried to grow squash from seed for the first time. Actually first time for growing it from anything. 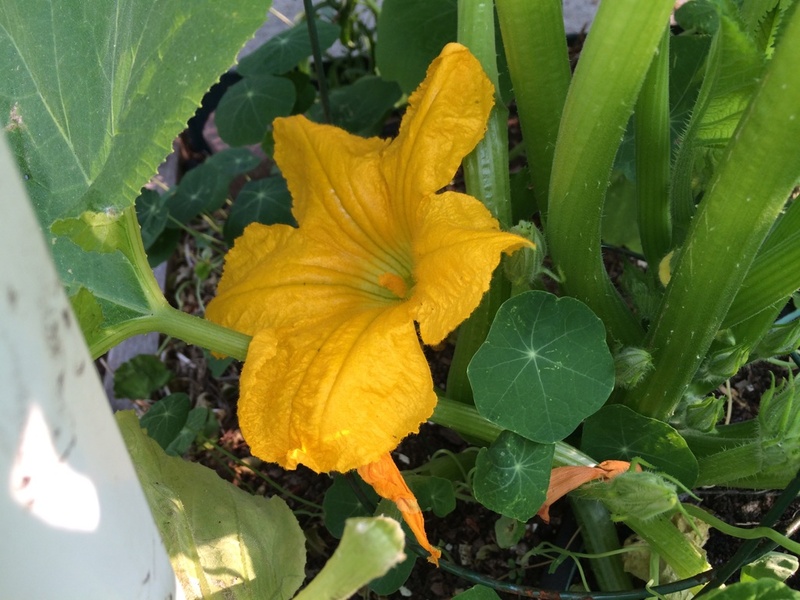 I’m not a big fan of zucchini and other summer squashes, and just didn’t want to bother with an entire growing season of caring for winter squash for the sake of one or two pumpkins. 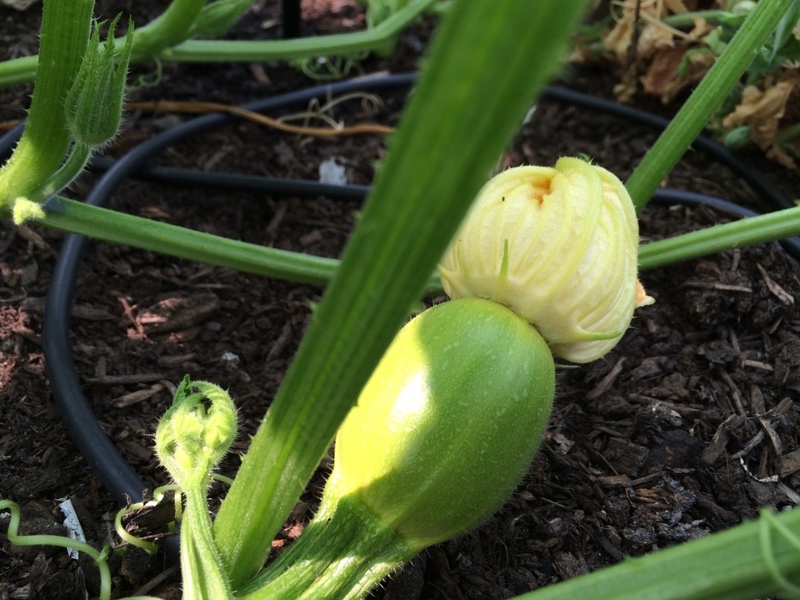 Apparently most people expect a better harvest than one or two squashes, but my vegetable-growing skills aren’t as developed as my other-than-vegetable gardening skills, so I keep my expectations low! The reason I decided to grow something that I didn’t much care for was mainly to promote a little more fresh-food-balance in my usually suboptimal diet. Food fresh from the garden is undeniably better tasting than food from the grocery store. And when you harvest yourself, you neither have to go to the grocery store–one of my least favourite tasks–nor store the food once you’ve bought it. You just go outside, pick what you want, and either eat it fresh or cook it within minutes of picking. 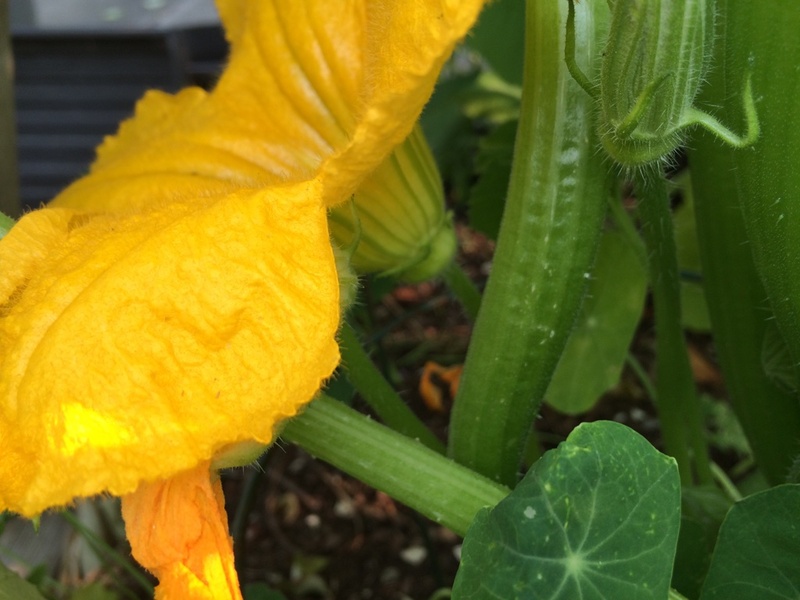 Now here I am trying again, and my Pattypan squash has just begun to flower–MALE flowers! Aaargh! 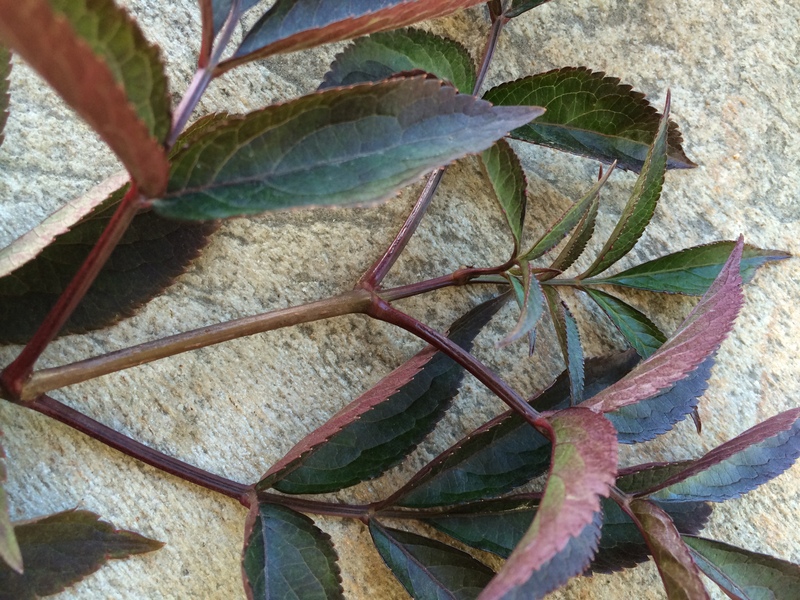 Checked in with Mr. Google (because of course barely remember what I read 5 minutes ago, never mind 5 years ago) to find that it’s totally normal for the first week or more of flowering to be all male, and indeed, as I look more closely at the rest of the vine, I see female buds way up the line. The stamen (male reproductive part, picture above) looks different from the pistil (female reproductive part), but until you see the female (which I don’t have yet, so can’t show you), you don’t know what it looks like. 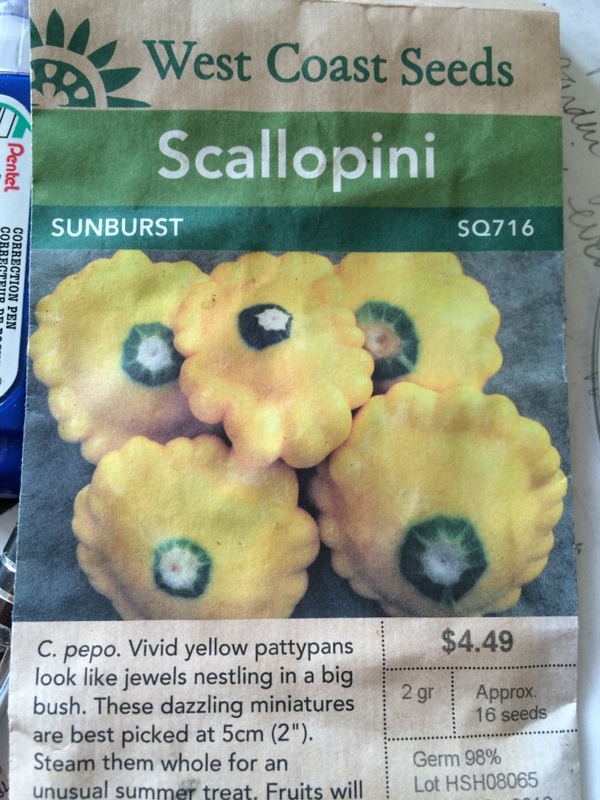 I find it easier to just look underneath and see if there’s an embryonic squash there. None here (above). Way up at the newest growth this teeny-tiny female flower is just beginning to bud. 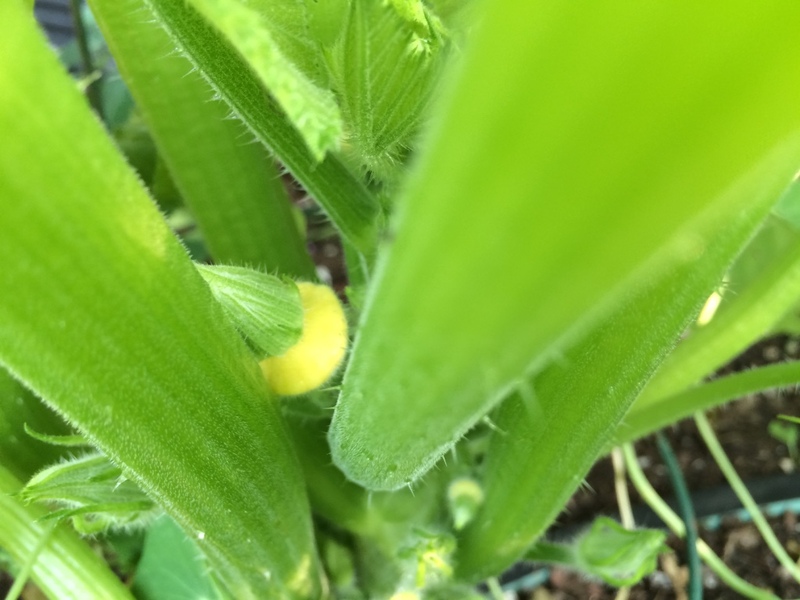 More Scallopini Squash flower buds–at least two female. 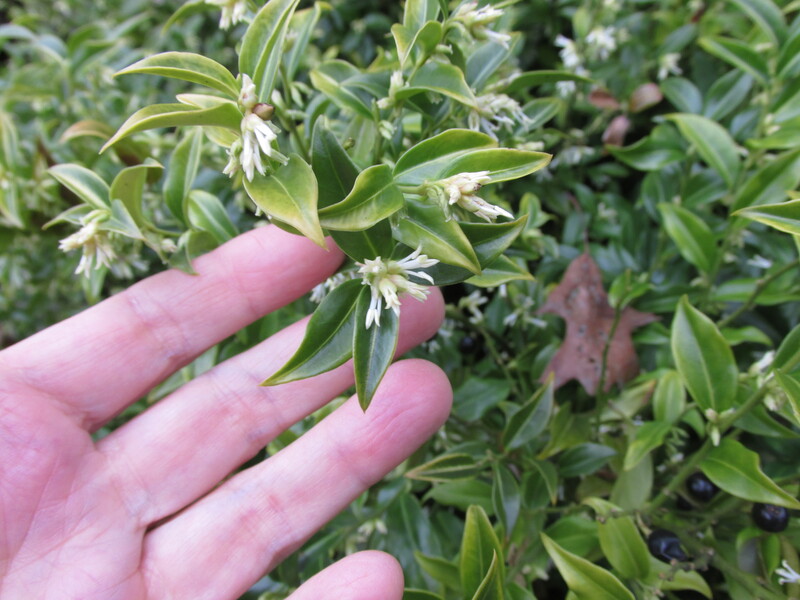 You can see here more younger female flowers. The flower is fading, and the fruit has started to grow. This one on the other hand probably never got pollinated, because it’s shrivelling away. And there are others the same that have fallen off the vine. What to do? 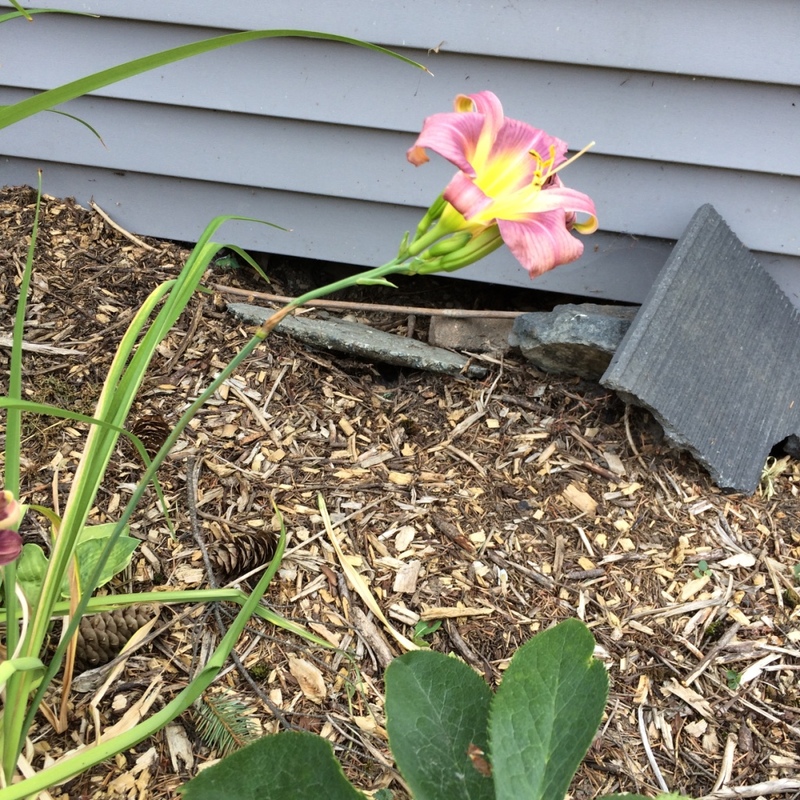 Well, optimally, you’ll have planted or sown pollinator-attracting flowers all around. 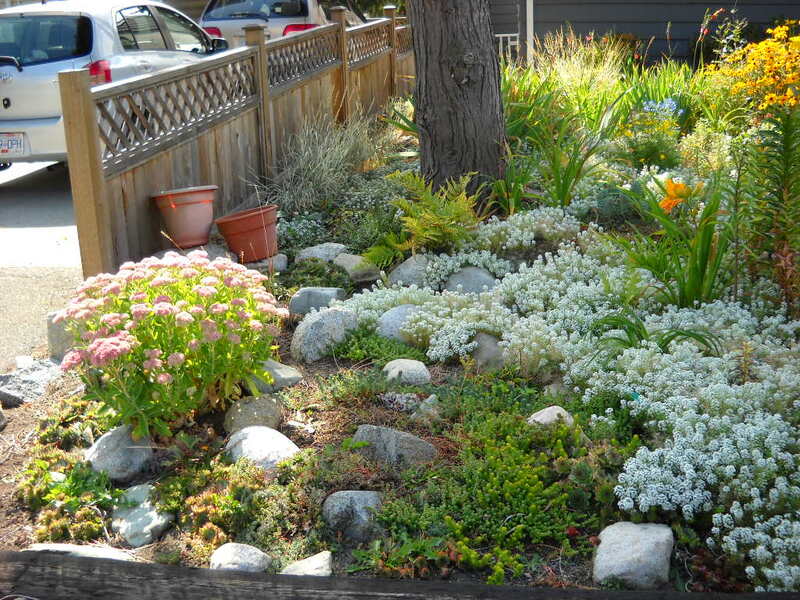 This would include all the parsley family–dill, cilantro, parsley etc., and anything else that has tiny compound flowers like that–alyssum, annual candytuft, yarrow… But maybe you didn’t. All is not lost, you can pollinate the female flowers yourself, as long as you have a male flower. 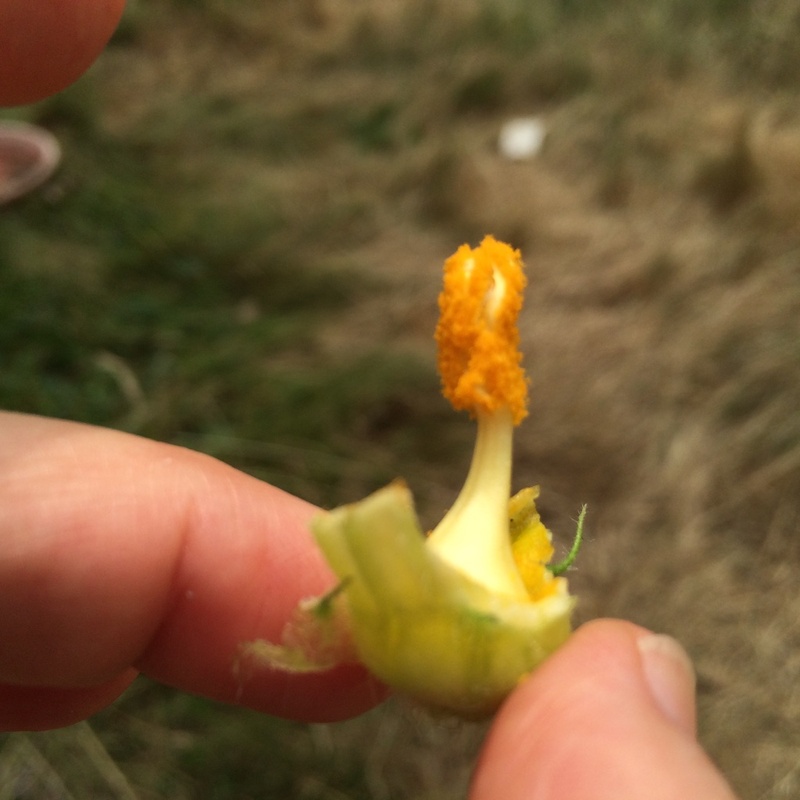 Here’s the male flower again, with its stamen loaded with pollen. 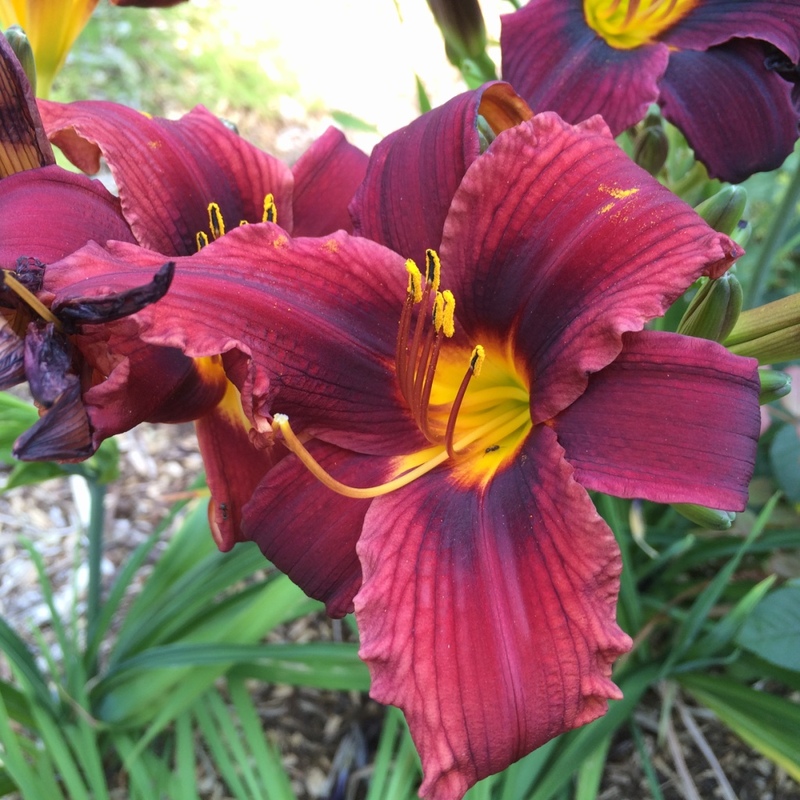 Since you of course read my post on hybridizing daylilies, you know where this is going. 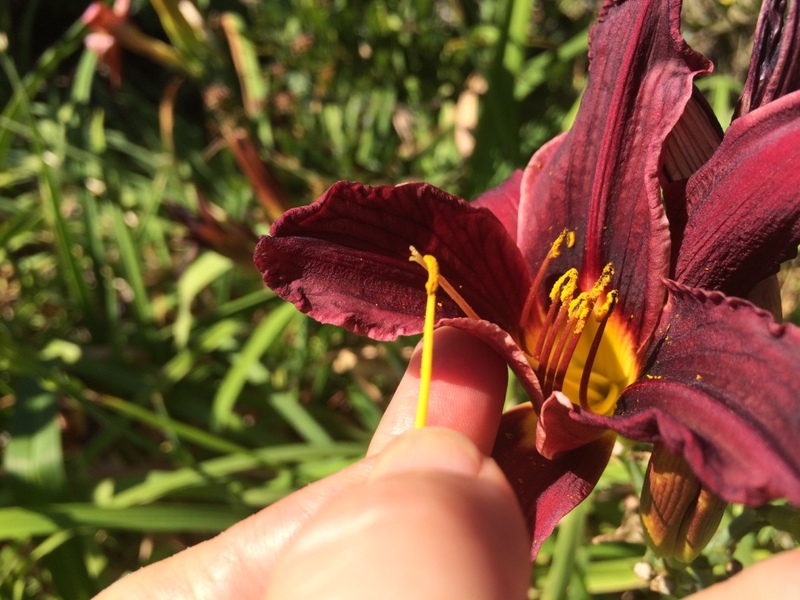 You’re going to use the stamen as a wand to apply pollen to the female flower. Since the stamen is pretty short, it’s easiest to just remove the petals so the “wand” is a little easier to wield. Now you’ll just dab the pollen on to the pistil of the female flower, which I can’t show you, since I still don’t have any female flowers ready. Nor does my neighbour, or I would certainly “borrow” it for the sake of the lesson. 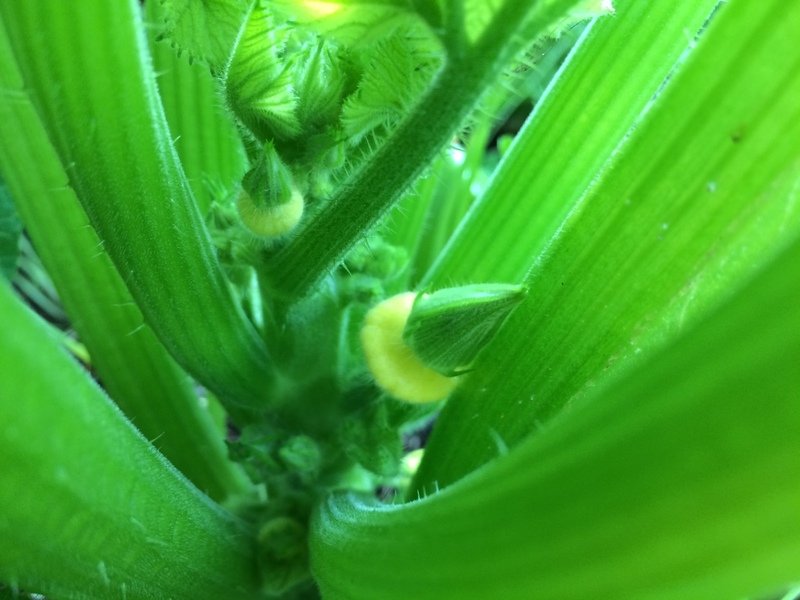 One last thing: you, like me in my previous attempt to grow squash, may still have only male flowers. Not only do the female flowers come out later, but they are less likely to appear at all in the presence of stress. 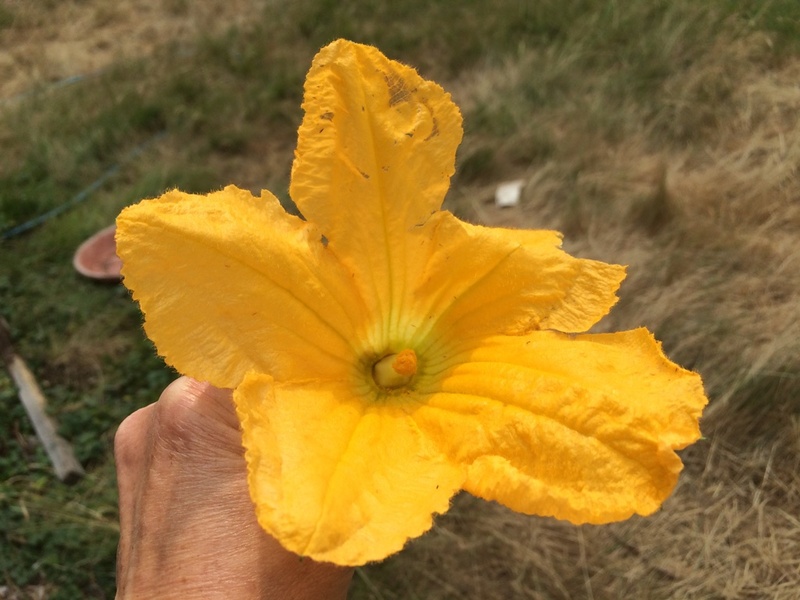 Not enough water, not enough food, not enough sunlight are the main problems the squash plant may experience and therefore not have the resources to produce fruit–ergo no fruiting flowers. 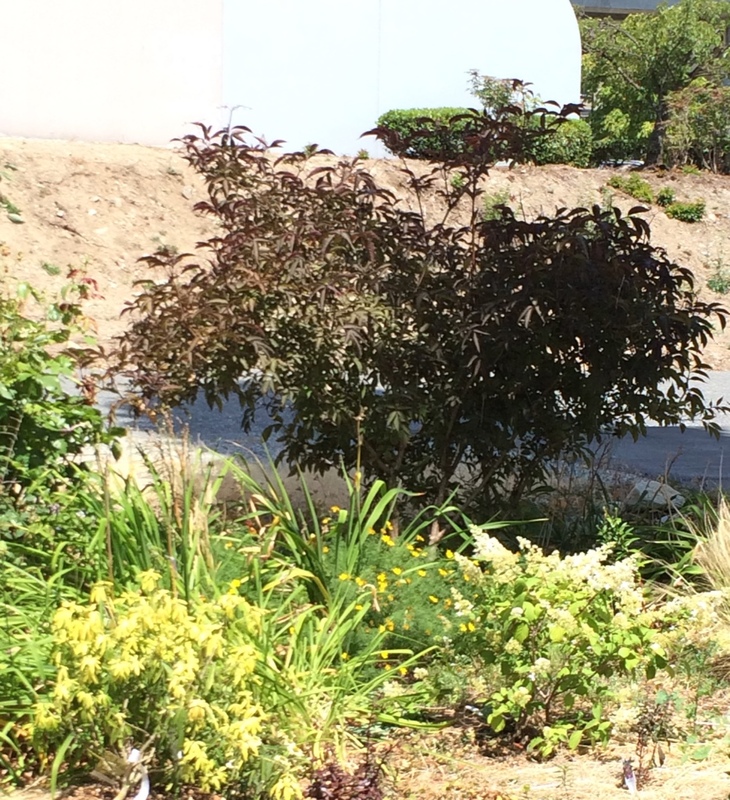 Water: enough to maintain damp soil 4-6″ deep. 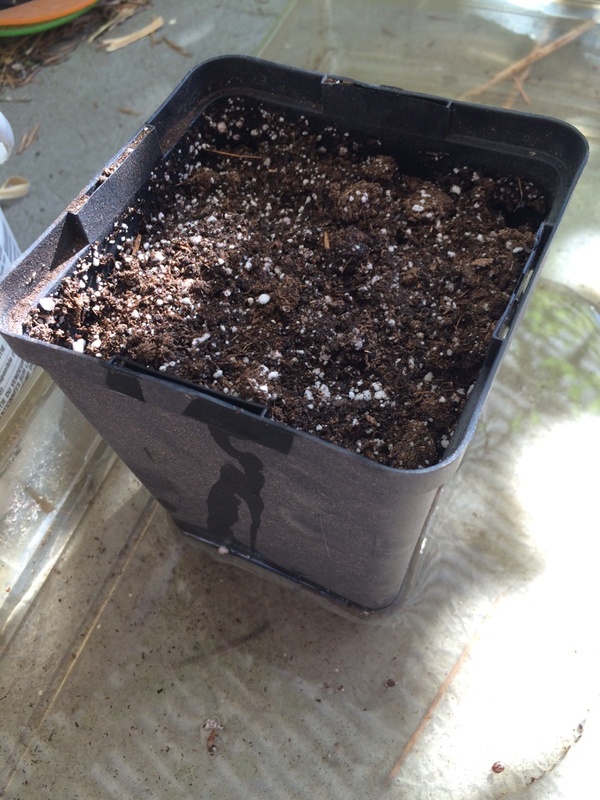 That may be 1″ per week, or more if you have sandier soil, or more plants, or more fruiting. You’ll need to check. Sunlight: “full sun” is considered to be 6-8 hours of direct sunlight per day. You’ll need to check. Food: use a good shovel-ful of compost in each planting hole–but we’re beyond that. Add 2″ of compost now, and if you have a few flowers, it’s the right time to add organic fertilizer according to your package directions. There you have it–everything you need to know to get your squashes back on track. If they were off track. I think I’ll assume mine are a little off-track and increase my watering and feeding schedule. I haven’t been checking. 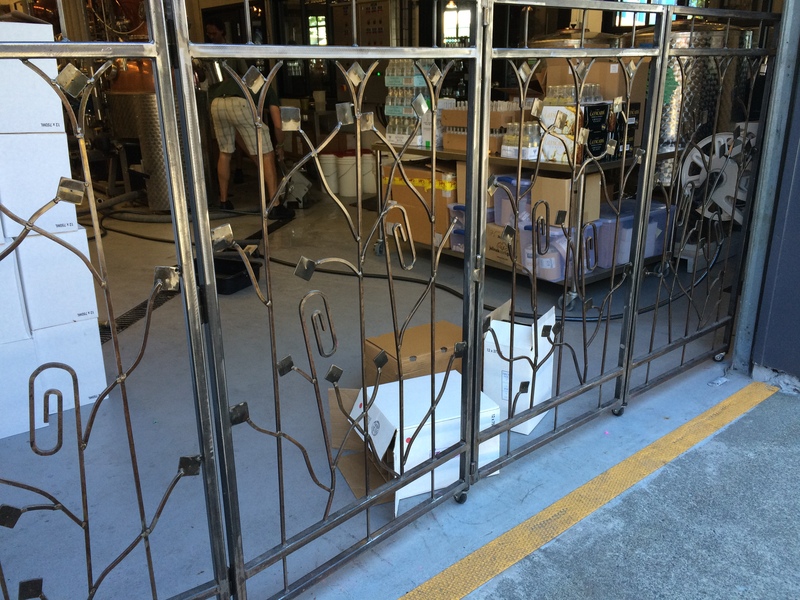 Do you want to add a vegetable garden design to your outdoor space? Contact RLGS via the About/Contact page. 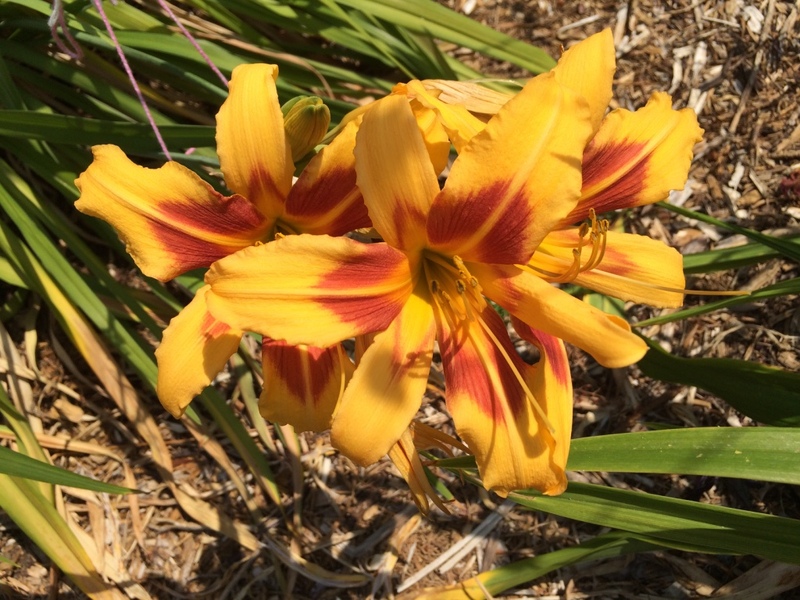 If you want to increase your plant stock economically, you can’t do better than hybridizing daylilies. But that’s not why I did it. 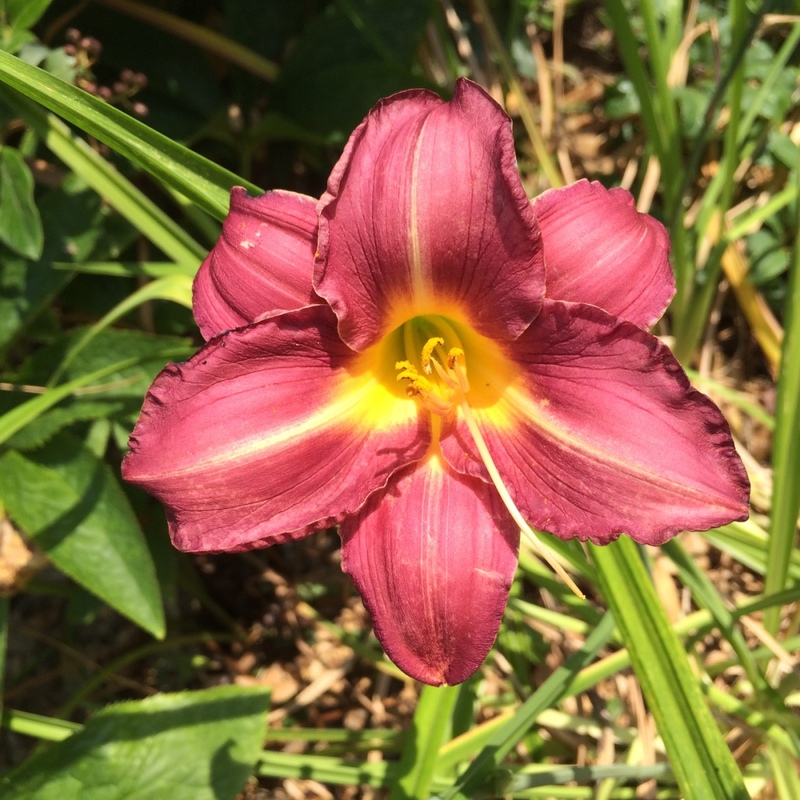 When I saw how easy it was, and that I actually got seeds, and that I could plant them, and that I could get brand new, never seen before daylily flowers, I was hooked. 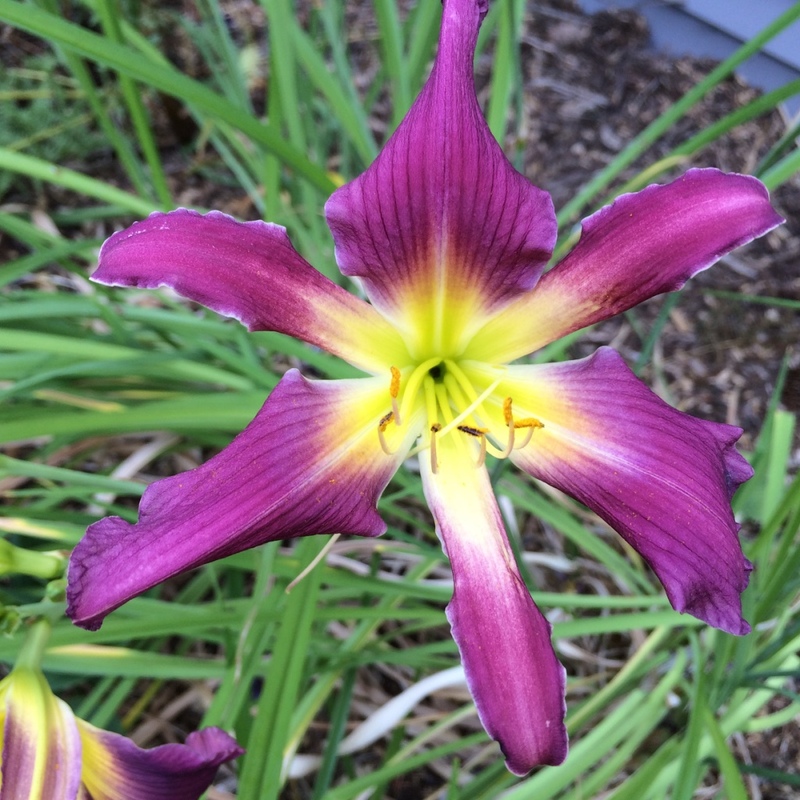 Now not all your daylily plants will produce beautiful daylilies. 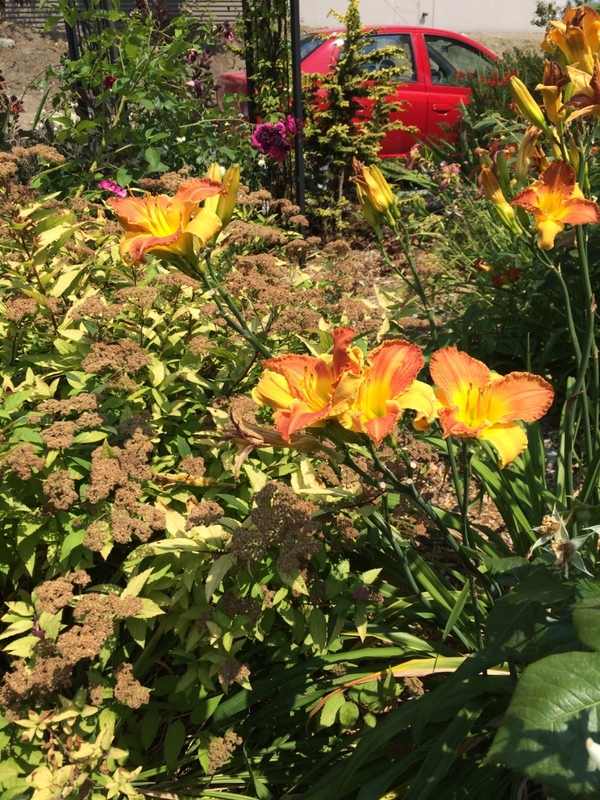 What’s more, our local daylily expert, Pam Erikson, says it takes several years before a daylily produces its final (mature) “product”. 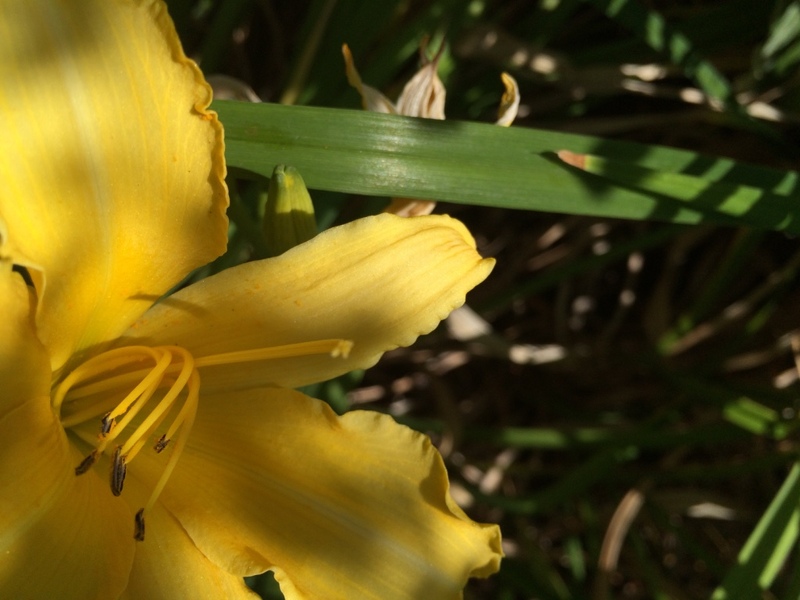 Daylily: This is a pretty flower, but a suboptimal flower stem. It’s leaning way over under its own weight. 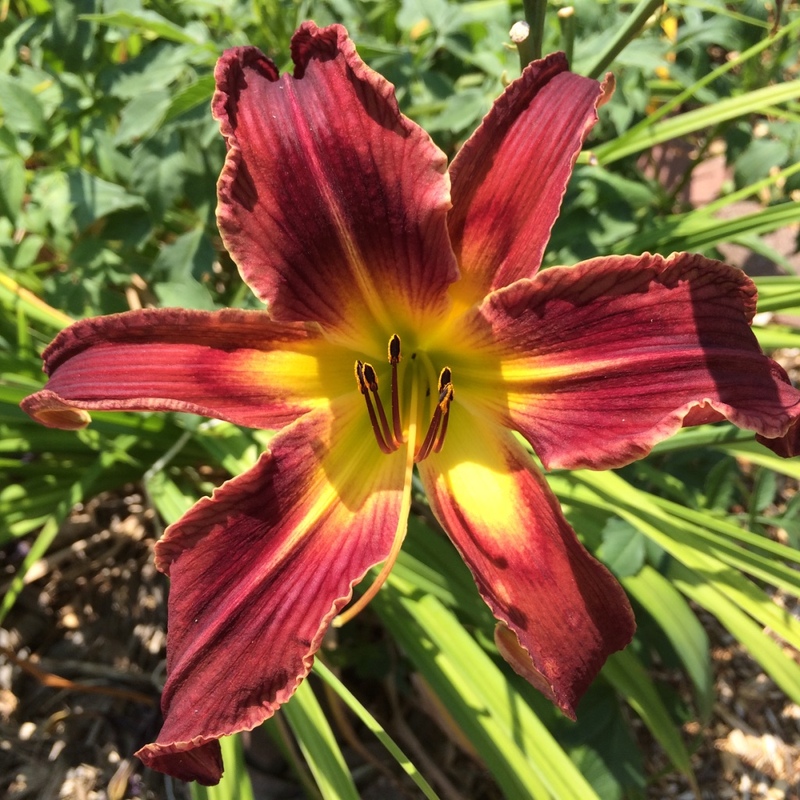 Daylily–This is a sweet diminutive flower–should be at the front of the border, whereas it’s currently hidden behind taller things. 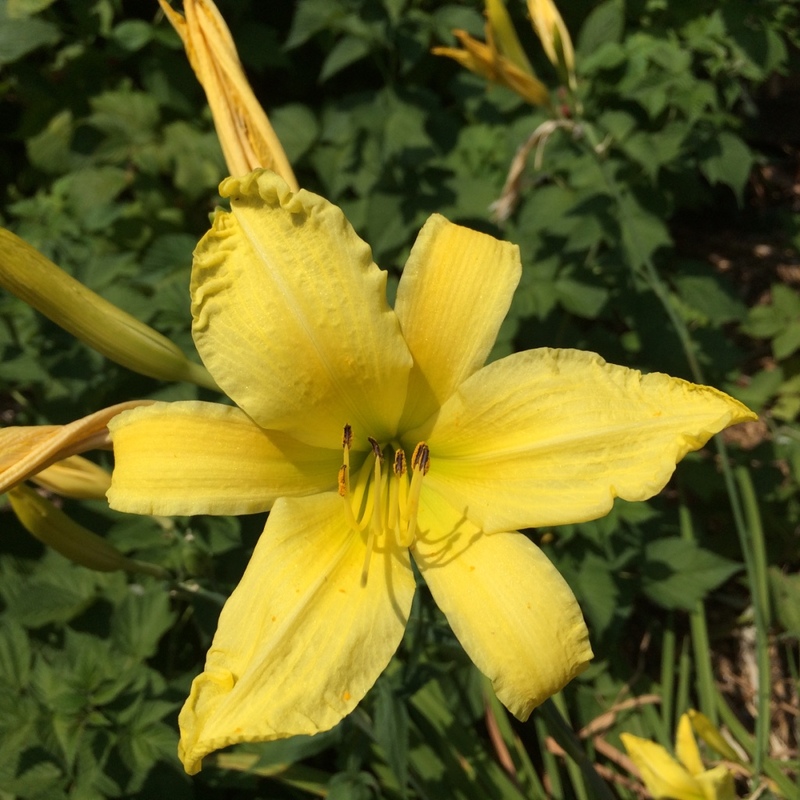 Daylily–Love the neon yellow throat. 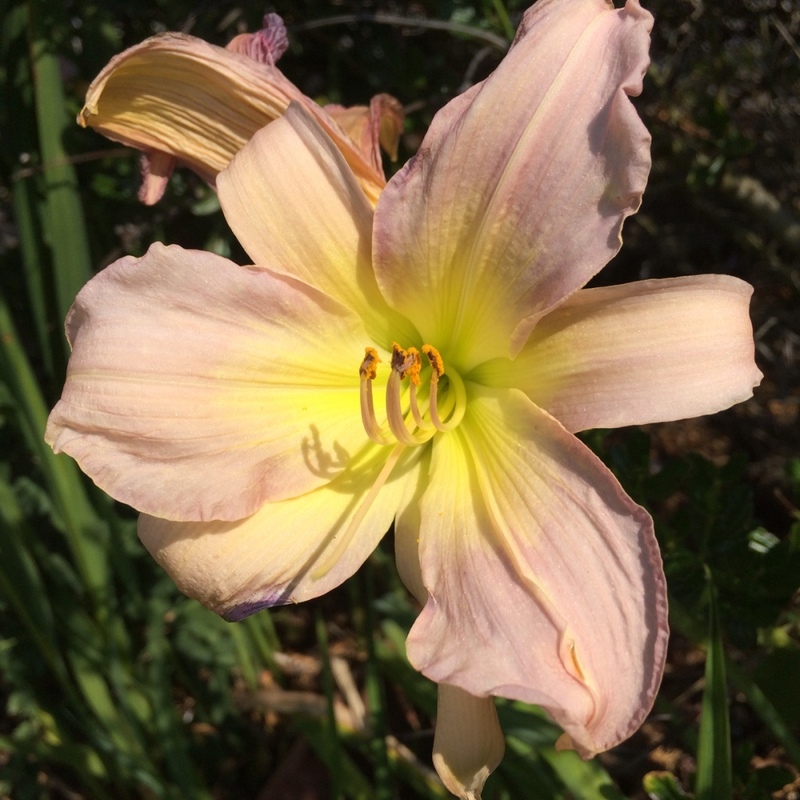 Daylily–Another with a neon yellow throat. 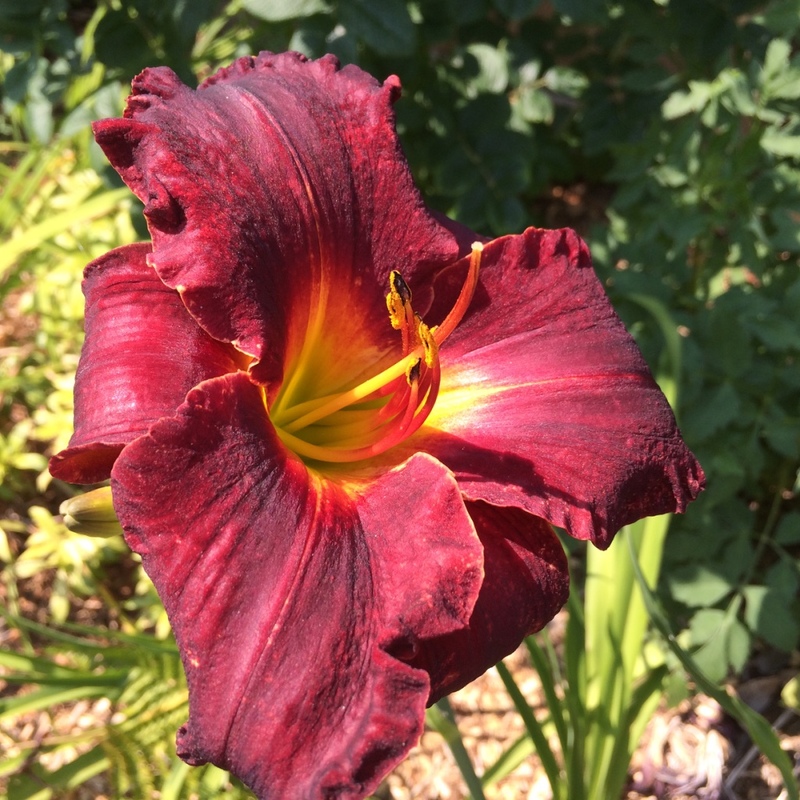 Daylily–This is another that the camera misrepresents: it’s sort of a pink-ish red. 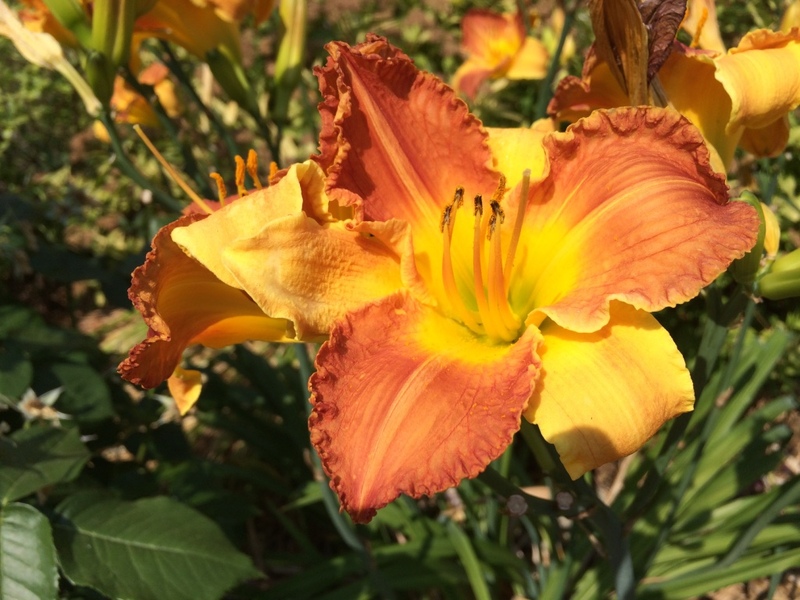 Daylily–One of the daylily styles is called “spider”. 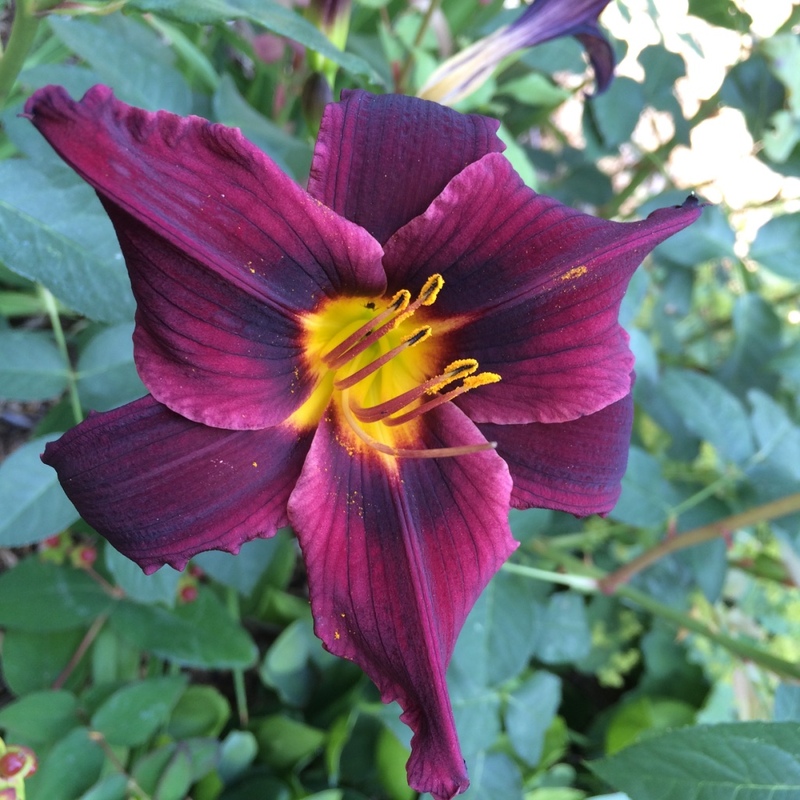 This one is almost a spider–should have slightly more folded/thinner petals. but I like this one. Would like it better if it had more flowers per scape. 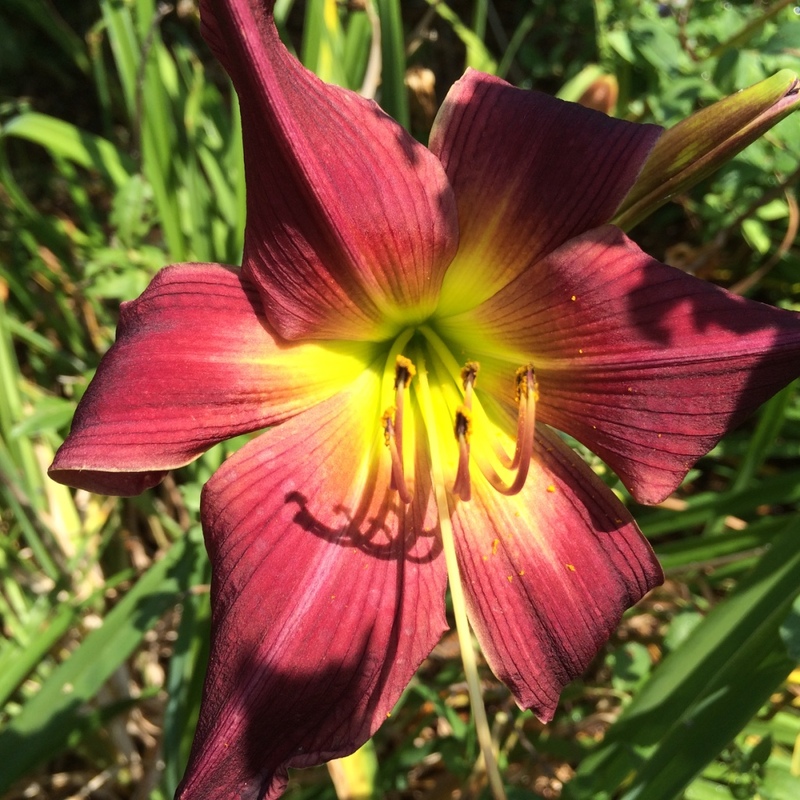 Daylily–Now this and the next really are my favourites. And again, the camera did a mis-service: it’s actually even darker in colour. 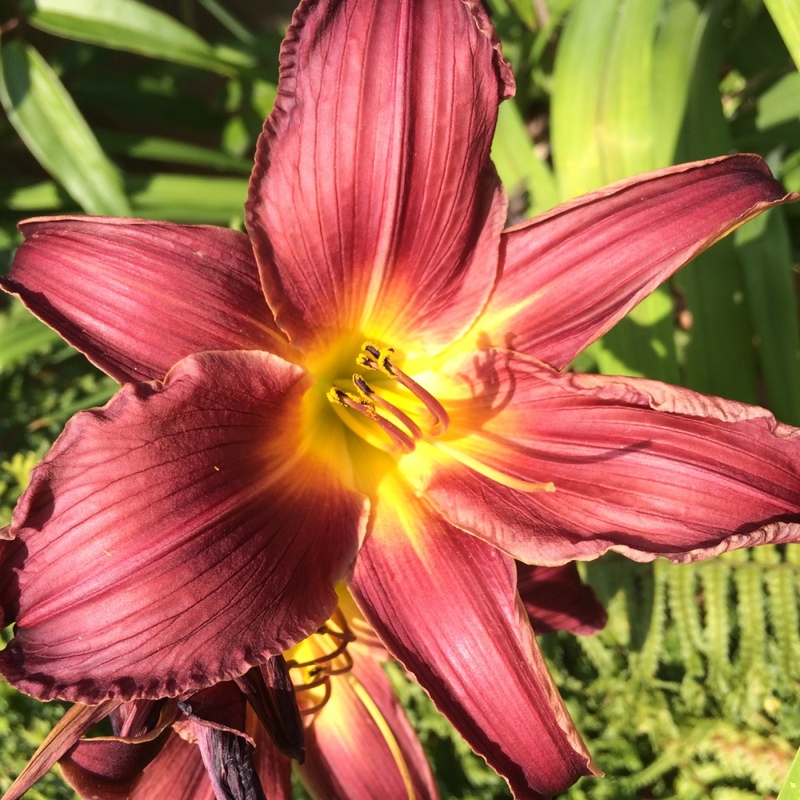 Botany 101: Reproductive parts of the flower: male parts are the anther holding the pollen, and the filament– the stem holding up the anther; collectively called the stamen. 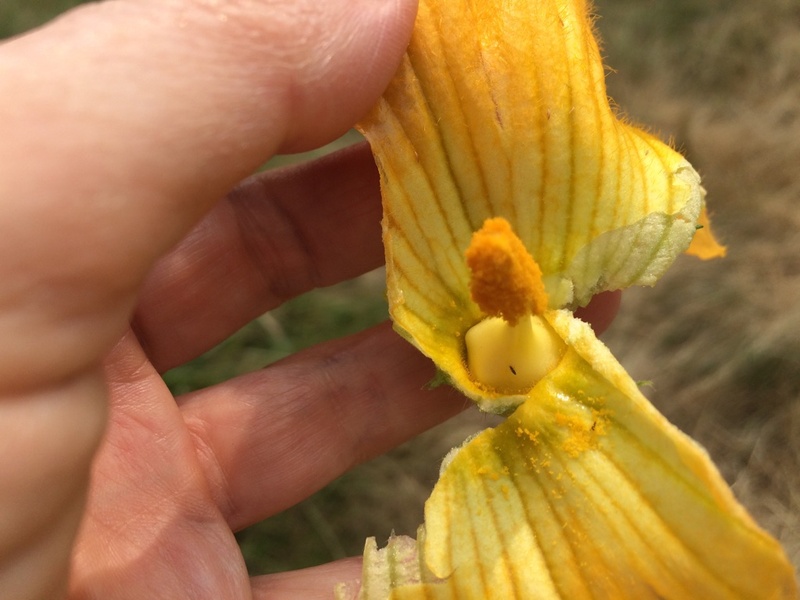 The female parts: the pistil with the stigma at the top (blurry white dot in the pic) which receives the pollen, and the ovary at the base of the stem, or style. 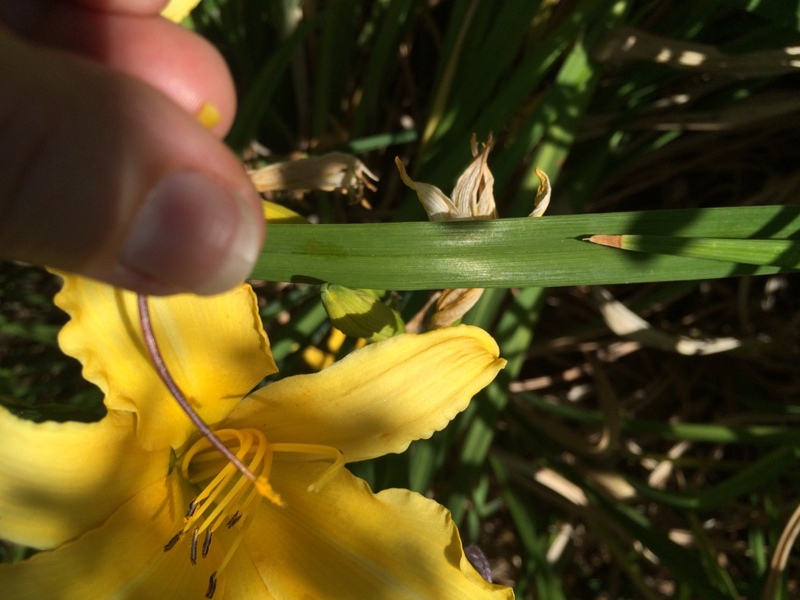 Carefully break off a stamen with lots of pollen. Choose a different dayliliy that is also fresh–they only last one day, so it’s pretty impossible to get a non-fresh bloom. 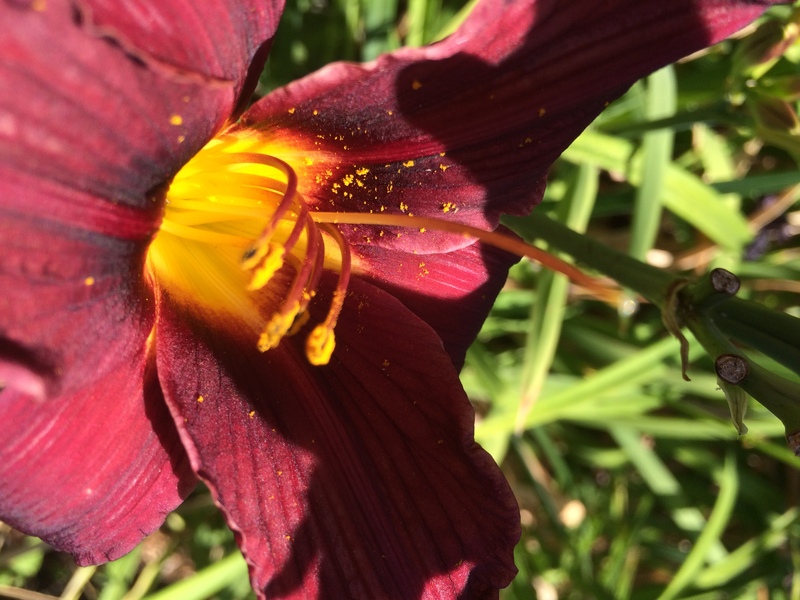 Using the pollen from the same yellow daylily to pollinate the red daylily. The ovary is swelling with developing seeds. The visible stumps are where other flowers fell off, but this one actually pollinated, probably by birds bees or bugs. 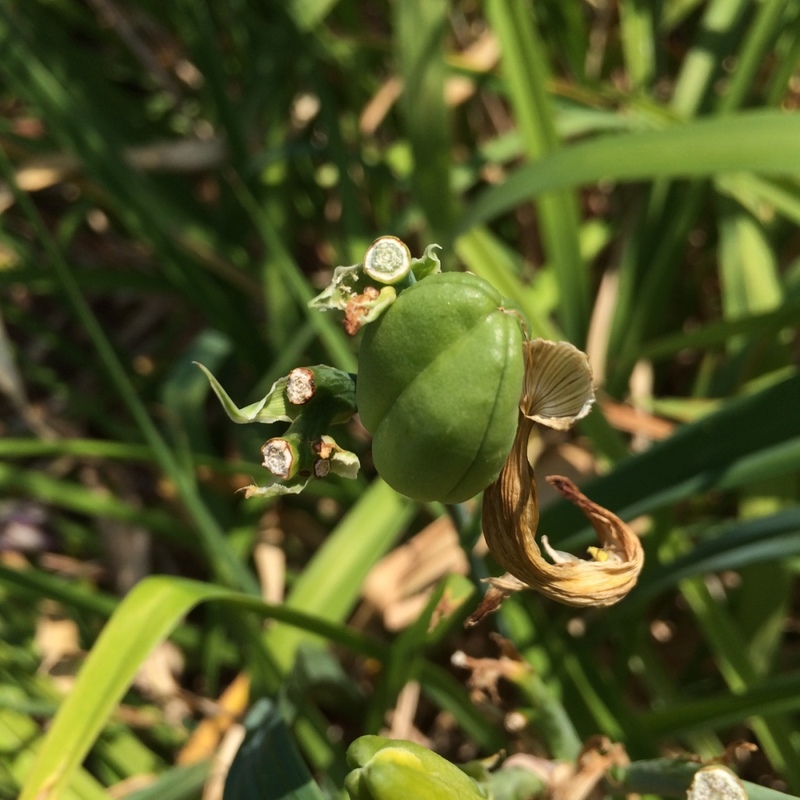 Like people, pollinating uses the genetic material of one plant and adds it to the genetic material of another plant, yielding an infinity of variations. You may get anywhere from one to 21 (or so) seeds per pod, and every one will produce a different looking plant. 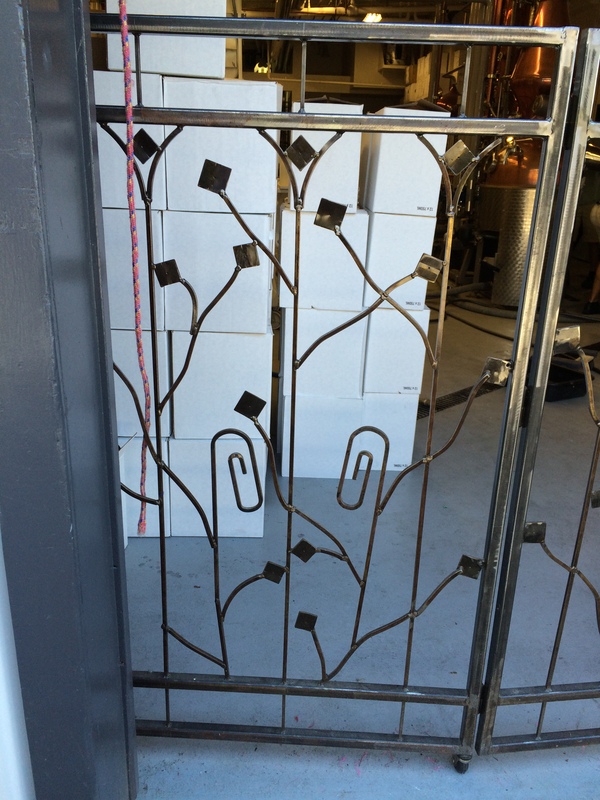 These are over 4′ tall and perfectly upright. With lots of flowers on them. This is definitely a keeper. 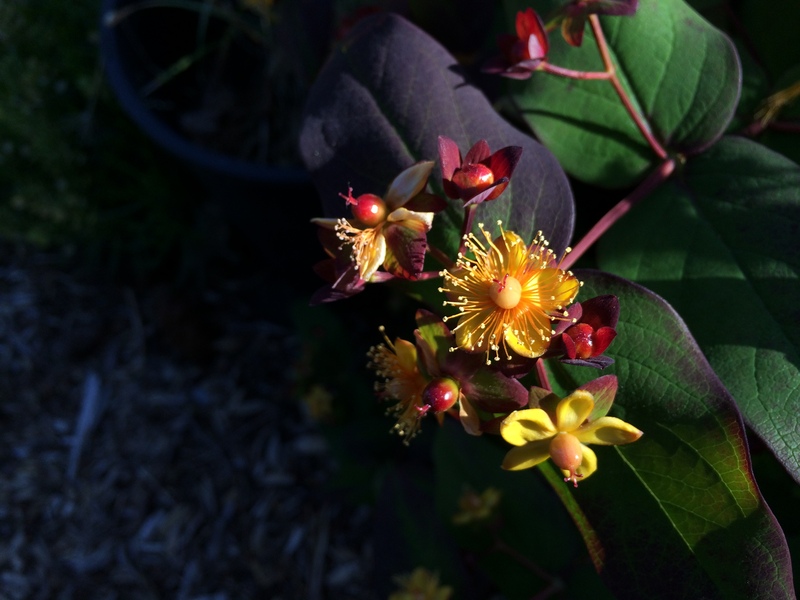 This on the other hand, altho a cute little flower, can hardly stay upright with only one flower in bloom. And hardly any other flowers. I’ll give it one more year to see if it changes, then if not, “shovel prune” it. This one is just too boring for words, so like I’ve done with many others, I’ll dig it up and put it on the street for someone else to give it a home. Or I’ll bring it to Garden Club next week. I’m getting pretty ruthless with my “babies”. Pam Erikson said she gets as few as one marketable plant out of 5000 or so hybridized. She has pretty strict criteria. If you have any questions about how to do this, leave a comment.